An endless content repository is a double-edged sword. If users can’t find what they are looking for or discover content they are interested in, they are almost guaranteed to abandon your app. Many apps aim to improve user retention by helping users continuously discover relevant content, aided by their self-reported preferences. The foundation of this type of personalized in-app user experience is often built during user onboarding. Let’s look at some of the top media and entertainment apps leverage user onboarding to create tailored user experiences. We’ll also call out some relevant test ideas along the way. Pandora, one of the most popular music streaming apps, is powered by the Music Genome Project. Though Pandora has a team of curators, music analysts, and data scientists that sift through millions of tracks to create personalized recommendations for users, Pandora still uses self-reported user information as a building block for designing this curated experience. As first-time users sign up for a free Pandora account, they are required to fill out their birth year, location, and gender. 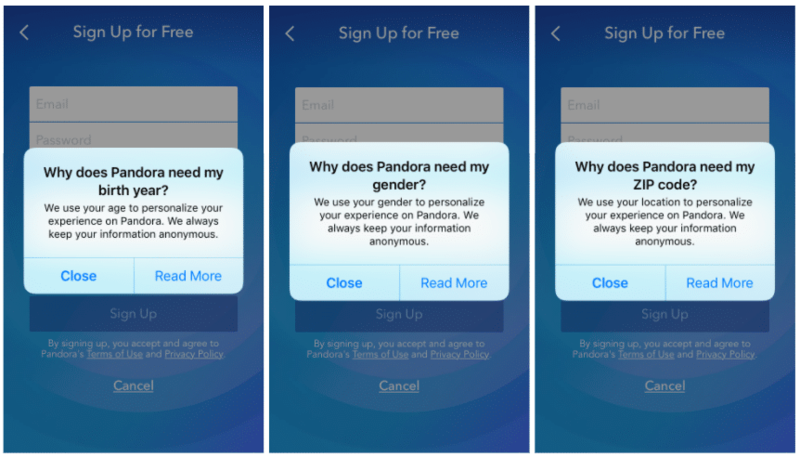 Users hesitant about providing this information can tap on the “why?” in the form fields to learn why Pandora needs that information. Unlike Pandora, which does not use machine-listening or other forms of automated data extraction, Spotify leverages AI technology to surface the right content to the right user at the right time. However, just like Pandora, Spotify also asks new users for their date of birth and gender as they sign up for a free account during onboarding. Spotify does not justify this ask to its prospective users. Test Idea: Does explaining why you need users to provide their gender, age, and location increase signups? Test Idea: Should the user information collected in the first step help customize subsequent steps in their user onboarding flow? Compared to Spotify and Pandora, Vevo’s signup form is fairly simple, as it doesn’t ask users for their age, gender, or ZIP code. Upon signing up, users are taken to their personalized home screen, which includes artists and suggestions based on their self-reported preferences. Test Ideas: How many fields should you include in your signup form? Which combination of login options (email, Facebook, Google, etc.) maximizes signups? Like Vevo, ESPN’s onboarding process allows for optional user curation. However, users can only start this process of adding their preferences after passing on the ability to sign up or by actually signing up. Test Idea: Should you ask users to sign up before or after you ask them for their preferences? Does investing upfront time and effort customizing their preferences make users more likely to sign up? How does each piece of data collected to personalize the in-app experience impact long term engagement and retention? ESPN also spearheads its users’ onboarding journey by asking them for location permissions, which it uses later to suggest teams to follow. Test Idea: Where in the user onboarding flow should you ask users for location permissions? From the business model to the user base, each app is wildly different. One-size-fits-all best practices rarely work. This post isn’t a list of best practices and probably left you with more ideas than answers. How much information should you ask? Does the added long-term benefit (increased engagement and retention) of each piece of user-information collected or each additional step during the onboarding flow justify the cost incurred (fewer users due to drop-off) in collecting that information? The only way to accurately answer these types of questions is by testing. And even then, sometimes your results may be counterintuitive until you dig in and see the whole picture. For example, personalized recommendations might cause users to open less new content but actually spend more time on each piece that they do watch. A deeper analysis of test results can help you make a more informed impact that a change has on the LTV of users.